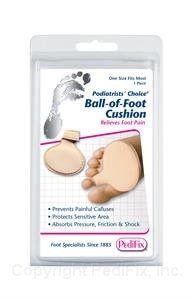 Protects forefoot, helps relieve and prevent pain and calluses. Absorbs shock and reduces friction. Soft, double-layer foam pad stays securely in place with a comfortable toe loop. Hand-sewn nylon cover for extra durability. Great for thin-soled footwear. 1 per pack.